MANILA -- President Rodrigo R. Duterte lauded the disaster response and rehabilitation presentation and viewing of equipment of Israel on Tuesday, saying he was inspired to replicate it in the Philippines. The Magen David Adom is the State of Israel’s national organization responsible for emergency, disaster response, pre-hospital care, and blood services, an equivalent of a National Red Cross Organization. 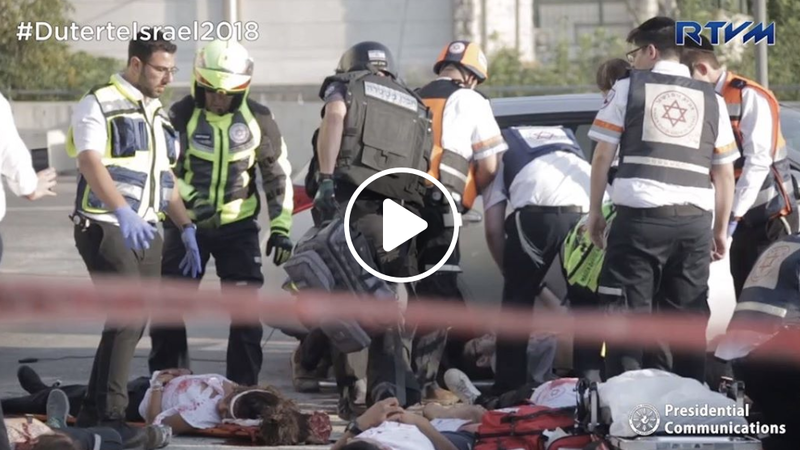 During MDA's demonstration, Duterte said that having technologies similar to Israel would be beneficial for the Philippines, especially in times of disasters, like terrorist attacks. “There's a lot of terror attacks going on, not only here but all over the world and my country is no exception. We just had about two explosions in one of the provinces in Mindanao. And we expect more. And I'm sure that your government... Israel government would only be willing to help us,” Duterte said after the simulation of MDA’s response system. Duterte, meanwhile, pointed out that in the Philippines, the government had much to improve in terms of having a more effective disaster response system. “We have a similar thing like that in my city, but it needs a lot of improvement. Of course, the way you handled the response was very important. And I think that we have to improve on that, “ Duterte said. “We have the electronics, it was done by an American company. It’s good but I said we need more transportation and we need more men with experience to respond the way that I've seen here,” he added. Accompanying the President during the MDA’s presentation were Philippine Red Cross Chairman Senator Richard Gordon, Executive Secretary Salvador Medialdea, Defense Secretary Delfin Lorenzana, Special Assistant to the President Secretary Christopher Lawrence "Bong" Go, Interior and Local Government Officer-In-Charge Eduardo Año, and Presidential Adviser for Political Affairs Secretary Francis Tolentino.